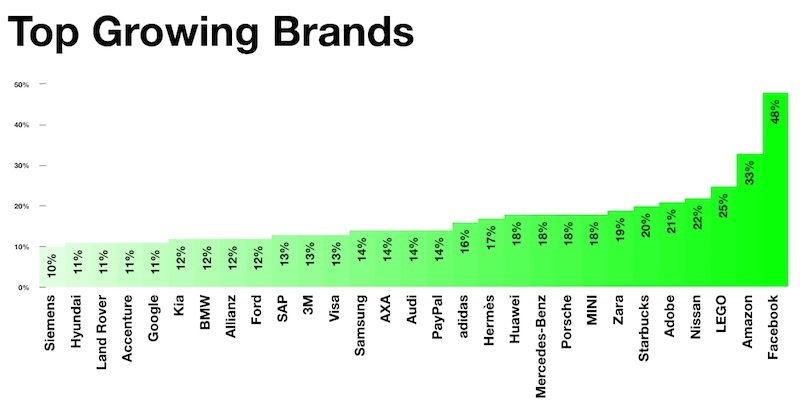 Apple remains the world's most valuable brand this year, topping Interbrand's annual rankings for the fourth consecutive year. Apple's valuation rose 5% to $178.1 billion, ahead of tech rivals like Google, Microsoft, and Samsung, despite iPhone sales declining for the first time this year in line with the company's first revenue decline since 2003. Apple's brand value has steadily risen since 2002, when it was worth $5.2 billion, according to the study. Apple shows how ecosystems drive value. Analysts have often pointed out that “Apple has superior products.” While true, this opinion undersells the brilliance of Apple’s functionally integrated model. Its software, hardware, and touchpoints are connected not just by beautiful design aesthetics, but by a level of interoperability that justifies the Apple premium and discourages defections to another platform. And the more data you share, the more personal it becomes—adding new devices is painless and the thought of switching increasingly unpromising. Apple is the Alpha of Cohesiveness in full effect. Coca-Cola, Toyota, Mercedes-Benz, and GE were the only companies outside the technology industry to make the top ten, which also included IBM and Amazon. Coca-Cola's brand value dropped 7% to $73.1 billion, continuing its decline since Apple overtook it for the top spot in 2013, according to Interbrand. Interbrand is one of several brand rankings released each year, with others including Forbes and BrandZ. Apple has consistently performed well in these studies over the past decade as its revenue has ballooned on the strength of iPhone sales. Apple remains the world's most valuable company with a $611 billion market cap. I was shocked to see Adobe is a top-growing brand... who still buys or rents that stuff?? ...you don't do much video/photo editing, do you? Every professional graphic designer or illustrator. Every printing company. Every publishing company. I love the Apple ecosystem. Nothing like it anywhere else. All of my devices are reliable and seamlessly integrate with each other and Apple's services to make a really great user experience for me. This is why Apple is still the number one: high quality devices with a great ecosystem. who?? millions and millions of photo and video editors. there is basically no match for their "stuff". Love seeing Coca Cola up there. Half of their earnings are from me! Apple shows how ecosystems drive value. ... ~snip~... Its software, hardware, and touchpoints are connected not just by beautiful design aesthetics, but by a level of interoperability that justifies the Apple premium and discourages defections to another platform. I read that as saying that all their products work so well together, why would anyone look elsewhere? Fact is, the iphone has a premium feel and is true pick up and play. The people I have asked say they can't be bothered with trying to learn or use Android. Only one (a fellow geek) has said that he loves the Apple ecosystem, or even recognises the existence of one! Accurate as that might be about the interoperability, if the statement about defections was also true then I would also expect to see Mac sales making up a much bigger percentage of the companies revenue. It doesn't though, the iPhone is by faaaaar the biggest product for Apple. This feels almost like sponsored PR puff to me.